One year ago, I started what I intended to become an annual tradition. On the occasion of my 42nd birthday, I decided to list my ten favorite bands of all-time. I wanted to explore how my musical tastes had changed over the years - or if they had changed at all. In my younger years, I never dreamed I'd still be listening to mostly the same bands two decades later. But in spite of the fact that I've continued to broaden my horizons and educate myself about the rich history of popular music, the list of bands I love the most has changed minimally between my 20s and my 40s. This isn't to say that punk rock is the only music I ever listen to. But it's still the stuff that is nearest and dearest to my heart, and clearly it's not something that I'll ever "outgrow". I suppose this is indicative of how I live my life. No matter how many double IPAs or oatmeal stouts or Belgian tripels I drink, nothing will ever hit the spot for me like a classic German lager. While other guys in the gym go for newfangled circuits or cutting edge machines, I'm only interested in the heavy iron. I have the same thing for lunch every day: a mixed greens salad with broccoli, rotisserie chicken, Newman's oil and vinegar dressing, and a side of Greek yogurt. I wouldn't say I fear change as much as I find it totally unnecessary. I tried to base my rankings on both the frequency that I listen to these groups and the importance their music has played in my life. As you can see, this year's list is only marginally different from last year's. The Dictators, who would have been just outside my top ten a year ago, jumped the whole way to #4 (I've been listening to them a lot!). Gen X bumps out the Buzzcocks. Otherwise, it's essentially the same list. 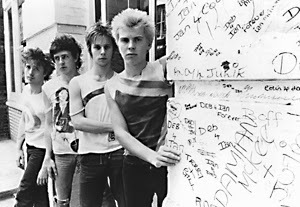 '70s punk still dominates my musical world, and my "big three" at the top remain locked in place. Next year's list, I'm betting, will be very similar. But you never know. I feel a polka phase coming on.